This vegan and gut healthy potato salad recipe is what I would consider an inspired-by version of German potato salad. I came up with this potato salad recipe while trying to find something creative to do with our probiotic, fermented pickles! Potatoes are a staple in our house, and are they super nutritious and great for gut microbiome health. So combining them with our Fermented Dill Pickles makes quite the healthy & probiotic dish. Well, potato salad can be healthy. German potato salad: Usually made with bacon and it's meant to be served and eaten warm. The potatoes are often cooked in a skillet until slightly crisp. Vinaigrette potato salad: Usually made with chopped boiled potatoes, other vegetables and an old vinegar mixture. Mayo-based potato salad: The good ole southern potato salad that I know... and never liked... except my mom's, her's was better than everyone else's. It's made from mashed up potato, egg, mayo and usually onion and herbs. Dairy-based potato: Generally the same as #3 but made with yogurt or sour cream instead of mayo. You can clearly see why potato salad isn't often made by health food bloggers. With a little adaptation though, something really healthy, delicious and probiotic results. We used Yukon gold potatoes from out local produce market, Southside Produce. Side note: love shopping there because we can shop plastic free for our produce. Anyways, when we snack at night I make what I like to call "potato crispies" aka spiralized potatoes baked to the perfect crispiness in the oven. I thought they would be perfect for this version of potato salad, and yep, I was right... because this is a potato salad I actually want to eat. BTW if you noticed in all of these pictures theres a big band-aid on my thumb, because I burnt my hand while taking the crispy potatoes out of the oven. Luckily I'm a crazy plant lady and have 5 aloe plants. Have fun with this recipe though; if you want to add sprouts or cherry tomatoes, do it! Get creative with it. 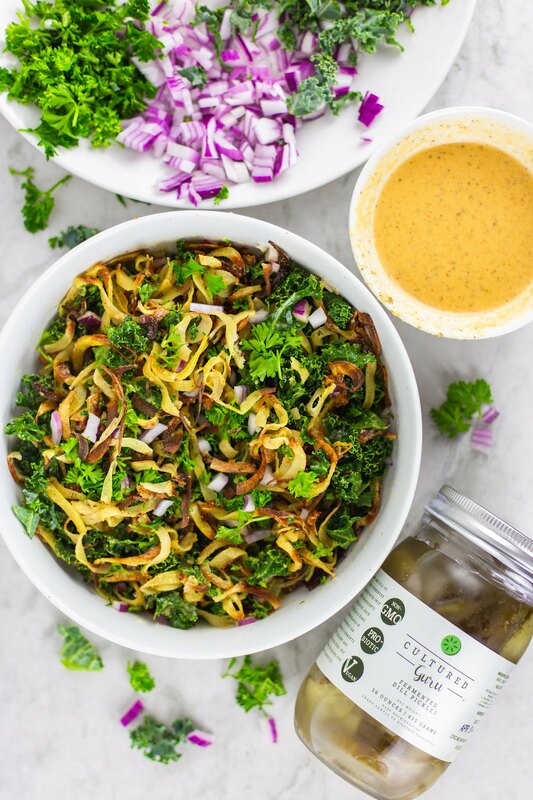 For this recipe we added parsley, sautéed kale, and chopped red onion. It's divine. For the sauce I definitely suggest using smoked paprika. It is the BEST. The vegan mayo we used is from Trader Joe's, but you can use a ripe avocado instead if that's more accessible. Since our Cultured Guru Pickles and Pickle Brine already contain salt, there's no need to add any... unless you love salt like I do. With the Cultured Guru Pickles included you get Over 200 billion CFUs of probiotics in this dish! Spiralize your potatoes using a larger spiral cutter. Rinse the spiralized potatoes in very hot water two times. Lay out the potatoes in a thin layer on the parchment paper-lined baking sheet. Bake at 400 degrees for 15 minutes, then flip the spirals over and bake for about another 10 minutes until they are golden brown and slightly crispy. While the potatoes are cooking, make the potato salad dressing. Combine the olive oil, vegan mayo, Cultured Guru Pickles and Pickle Brine lemon juice, smoked paprika, and pepper in a blender and blend until smooth. Once the potatoes are done cooking, remove them from the oven and allow them to cool for about 10 minutes. Once cool, slightly break apart the potato spirals. Add the potatoes, kale, parsley, red onion, and dressing to a bowl and toss to mix. Enjoy as a side for any summer time BBQ, sandwich, burger or as a solo dish!